Named after a waterfall that cascades silently down the headboard of your bed. A big painting of a Buffalo made by Lize dominates the headboard of this modernly styled room. The walls are painted in an earthy colour. Clay and earth are the overall theme with clay pots adding an African flavor while staying with the general theme. 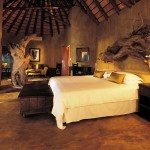 Named after a huge Jackalberry tree lying in front of the suite and emphasized by a huge leadwood stump that decorates the room. A rock stack forms the headboard complemented by a beautiful stone bath and other artifacts. 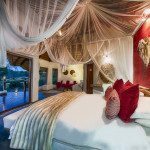 At Pondoro Lodge you will have the opportunity to choose from 5 truly luxurious suites. 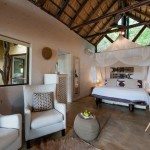 All our suites are air-conditioned and offer modern comforts in an exquisite African wildlife setting. 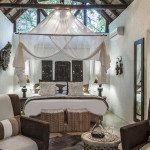 Each suite has a private patio, lounge area, an outside shower and Jacuzzi built into the wooden deck in front of the suites facing the river. 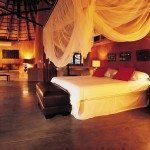 This is truly game lodge accommodation at it's finest. 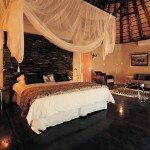 Each suite offers complete privacy to compliment the romantic setting at Pondoro Game Lodge. 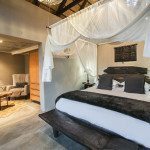 Pondoro Game Lodge has three tastefully designed chalets decorated in keeping with the African aesthetic and overlooking the Olifants River. 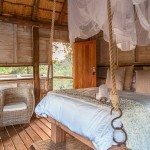 Pondoro boasts an overnight Treehouse Hide Experience. 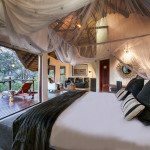 The hide overlooks a spotlit waterhole in the middle of the bush and is a must for those with a taste for adventure. Your adventure will begin after dinner with a late night drive to the hide. You will be picked up again during the morning safari. This can be booked as an extra activity to your stay for only R2995 per night for 2019. Please contact the lodge for more information.